The bundles offer a complete motion capture package with Facerig and Perception Neuron’s 32 Neuron Edition V2 system while customers already using Facerig will be eligible for a 10% discount toward the purchase of Perception Neuron to use with the facial animation software. Facerig Studio comes with a selection of avatars that can be used with the Perception Neuron mocap system. Now anyone can create or work with animated characters that have a complete and realistic range of motion that will bring them to life in ways that wasn’t possible before. Since debuting internationally over three years ago, Noitom’s Perception Neuron has been sought after by animators from all over the world. With its full-body motion capture capability, the Perception Neuron system can be used to drive original animated characters —one of the most popular uses of the system. Today, in a new partnership with facial animation software maker FaceRig, Noitom announces a new specially-priced bundle which combines Perception Neuron’s inertial-based motion capture with Facerig’s real-time facial animation software, to give users a complete character animation creation tool that includes movement in every part of the body including now the face. Facerig allows anyone with a webcam to instantly embody any character. Users can choose to record, export, or broadcast full body motion capture. Facerig’s software allows for export through FBX and DAE. The broadcast can be streamed to any service that uses a webcam such as Skype or Google Hangouts. Facerig’s state-of-the-art, real-time, image based tracking technology is provided by Visage Technologies and is combined with a cross-platform animation and visualization framework developed Holotech Studios and it's game industry partners. The combination of both Perception Neuron and Facerig’s real-time capability makes it possible for users to have access to instant digital cosplay. Facerig offers a wide range of original stock characters to choose from, and their built in tools make it possible to input users’ own, pre-created characters. The Perception Neuron and Facerig Studio suite will be available on the Perception Neuron website and includes the 32 Alum Perception Neuron motion capture system with Facerig’s real-time animation software for just under $1,750. Facerig users interested in adding Perception Neuron’s motion capture to their software, will receive a 10% discount toward the purchase of the motion capture system with proof of ownership. “Putting these two great tools together makes it possible for everyone to have the ability to get behind fun animated characters they can control from head to toe,” adds Nakajima. Also available will be accessories to use with the package including the Facerig Kit which consists of a camera, two batteries and a neck brace for $199 USD, and the stand alone Facerig Camera neck Brace for $59.99 USD. For more information about the Perception Neuron + Facerig Studio, or to purchase online, visit neuronmocap.com. To learn more about Facerig, visit facerig.com. 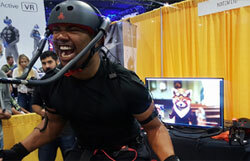 Motion Capture actor Jarrell Hall demos Perception Neuron and Facerig at NAB Show 2017.